In ELLINGTON BOULEVARD Adam Langer has produced a witty and totally original novel about the ups and downs of life in the wilds of New York’s real estate jungle. Returning home to Manhattan from his mother’s funeral in Chicago, unemployed jazz musician Ike Munson enters his apartment with his dog Herbie and finds three strangers in his living room – a slick real estate broker and a young couple ready to overspend to own Ike’s home. Furious at this invasion of privacy, he confronts them but, without a lease, he ultimately loses. Ike must begin his journey to find a place to call home in a world he can no longer afford. The chorus of stories – Ike, his dog, the real estate broker, and the young couple – will thrill the fans of Langer’s distinctive ability to bring to life a wildly varied ensemble of characters from different worlds. 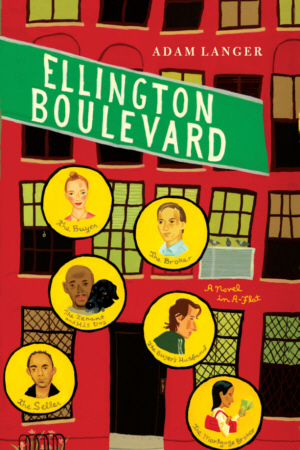 Written with humor and a healthy dose of satire, ELLINGTON BOULEVARD explores the rippling effects of the sale of one small and suddenly valuable apartment on 106th Street on the lives of his enormously entertaining cast of characters. — Stephen Schwartz, academy-award winning lyricist and composer for Wicked, Godspell, Pippin, and The Prince of Egypt.